I type stuff into computers to make them do cool things. PICO-8 on NES/SNES Classic Mini? What would it take to see pico8 on NES/SNES Classic Mini? Not just for playing but also for creating. USB keyboards can now be used via a micro USB OTG adapter so you could use it as a development machine. Of course it would be offline only, you'd have to sync with a computer to get your game off for distribution online. I was interested to see how easy/difficult it is to edit the animated GIF "videos" pico8 produces. My goal was to trim some frames from the begging and end to make a more succinct video. After much trial, error and experimentation here are my findings using Mac OS X. Open the GIF in Preview.app and it will show you all frames. Preview calls the first frame 1 (one), but other tools usually call it 0 (zero). If there is enough demand I will create a trimming tool that does not require you load terminal every time. It's an art exhibition of fictional NES cartridge art. Selected artists and designers are invited to contribute. It is hosted by and at a shop called Meteor in Tokyo, Japan. What is the jam about? It's fun to turn things around and make real games of the fictional artwork. I'm one of the hosts of this jam so I'd love to see some pico8 entries! Approaches to combat number limits? Given that all of this must have been solved during the 8-bit era are there any best practices or recommended solutions we should know about? but I can still use it? though it does seem to behave a bit oddly by eventually returning negative time? "Blaze is a miniature, high-res 1.6" 240x240 display with capacitive touch, a powerful 120MHz Cortex M4 micro with GPIO and storage." Cart uses ease_in_out_cubic (but feel free to edit and change to another included easing function). Here is my attempt at providing tweening/easing functions in PICO-8. They are based on existing work done by many other people. These functions help you animate sprites smoothly from one position to another, with different types of acceleration and/or deceleration. 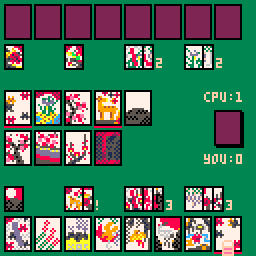 I am using them to animate cards around the screen in my Hanafuda Koi-Koi game. Maybe these are broken because I'm not familiar enough with how PICO-8 maths functions work? Any help appreciated getting those last few working is appreciated! I find the syntax of sspr involves too much work, so I wrote a wrapper function that requires less arguments and less thinking. It's really meant for Android and iOS, and has various modes of button configuration. However, when connected to my iMac it's seen as an iCade controller (as it is on iOS). I used ControllerMate OS X app to remap the iCade controls to cursors+z+x+shift+esc. And it works great! Maybe there's similar software for Windows & Linux to use this little gamepad? Maybe PICO-8 could add iCade support so we don't have to use external software? If you want to try this, feel free to ask questions!